Following up on the media’s DeLonge Overload we wrote about three days ago, there is a lot to report. 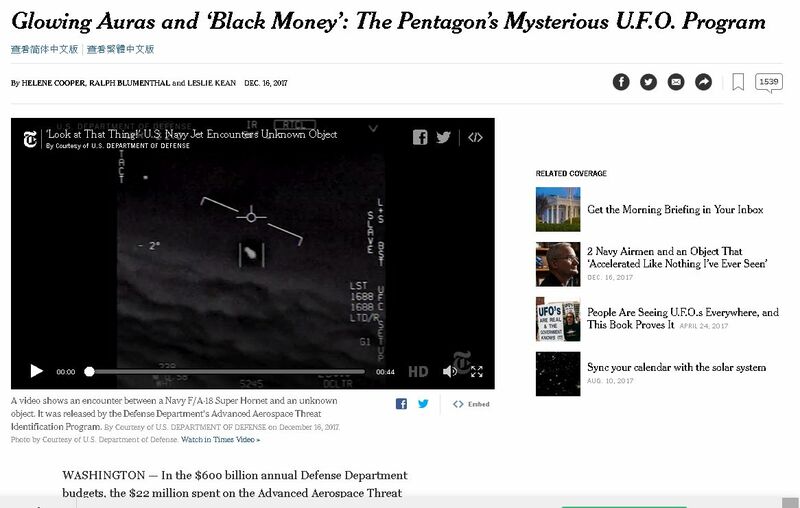 This struck me as a monumentally stupid thing to say, especially since a “glowing aura” was also visible in the “Groundbreaking” Chilean Helicopter Infrared video released by the “experts” in the Chilean government UFO investigations, that Leslie Kean (one of the authors of the current New York Times article) promoted so eagerly. (In that case, the “aura” was called an “envelope”.) That video has conclusively been shown to depict a distant jet aircraft whose position had been misjudged. An image from the “Groundbreaking” Chilean UFO video promoted by Leslie Kean in January 2017, later shown conclusively to be a distant jet aircraft. Kean’s Chilean “expert” labeled the object’s “envelope” (envoltura). I know exactly what the glowing aura is….it is a common image processing artifact called “ringing”….Frankly, I’m surprised the ATFLIR has it, we worked hard at [my previous company] to mitigate/eliminate this artifact. When in “white Hot” you will see that the aura around it is dark, and when in Black hot, it is brighter than the background. This is the image processing algorithm compensating for the large signal on neighboring pixels where the signal is not there, the algorithm doesn’t know the shape of the object, and over-processes the neighboring pixels. Very common when an object (like jet engines) are images over a cold background (like high altitude clouds). Miller says that the objects are likely distant jet aircraft, but we can’t see them clearly enough to be sure. Which is itself an interesting question – why is the quality of these videos so terrible? Bigelow’s company modified buildings in Las Vegas for the storage of artifacts gathered from UFOs? That does not seem to be possible, but that is exactly what the Times story says. How many tons of alleged UFO artifacts must Bigelow have to need to modify buildings to store it? I’m thinking it’s very likely that this was one of the same “UFO artifacts” that Bigelow had. If so, one would scarcely need to modify any buildings to house it. 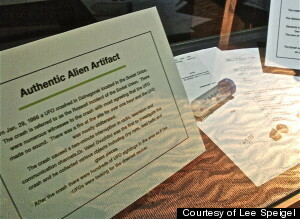 Lee Speigel’s photo of the supposed “Authentic Alien Artifact” in the Area 51 exhibit of theNational Atomic Testing Museum in Las Vegas. Did the NASA Hypersonic X-43A Play a Role in the “Tic Tac UFO” Incident? DeLonge Overload – And a Secret Federal UFO Investigations Program!